TAKEME Garden Solar Lantern, a great choice for your table, garden and all other outdoor (and indoor) . A fun, sustainable and beautiful way to make light, This Solar hanging Lanterns is ideal for garden lighting, decorating your courtyard, lawn,table and all other outdoor (and indoor) pursuits that would benefit from beautiful lighting to create a wonderful and relaxed atmosphere. Decorative solar garden lamp.The built-in solar panels convert sunlight into electricity. The rechargeable battery stores the energy and converts the power into light for use during the night. Stronger or longer exposure to sunlight enables the battery to store more energy and provide longer lighting hours. SOLAR POWER:Solar Panel collects sunlight to charge the batteries(included) during the day.Automatically turns on at dusk for up to 6 hours of nighttime illumination. 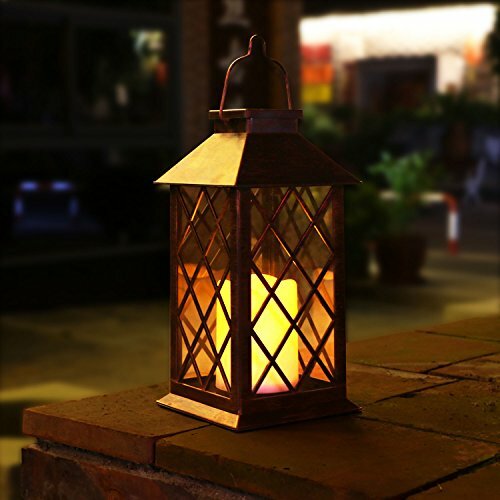 This solar lantern is illuminated by a warm white LED Flickering flameless Candles,which creates warm glow. PLS NOTE:This solar lantern includes 1 rechargeable battery , because 1 battery is enough for the solar panels. It allows working 8 hours after full charged. Size:5.51"(L)*14"(H)*5.51"(W).Material:Plastic+Glass;It's idea for a outdoor,garden,table,party and more. Make sure the button is in the "ON" position before change it in the sun.If the button is in "on" position,keeping the solar panel in the darkness,then the lights will light up.100% LIFETI REPLACEMENT GUARANTEE! Simply contact us if you ever have issues with your TAKEME lights.